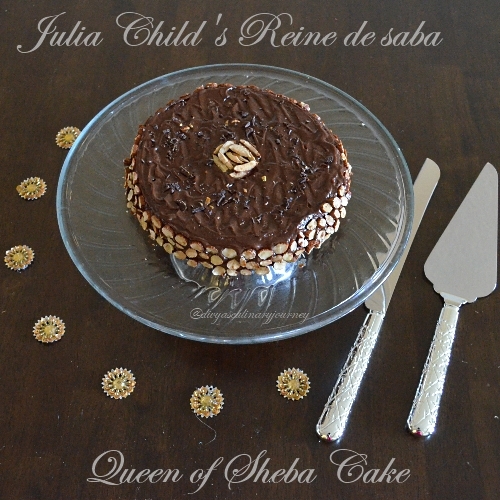 Today being the 100th birthday of Julia Child, this cake is a tribute to her. For those who do not know who Julia Child is- She was an American chef, cook book author and a famous television personality who was known to bring french cuisine to the American Public through her cookbooks and television programs. I myself didn't know about Julia before entering the blogging world. This week had been pretty hectic for me and I had to bake the cake at the last moment. Finally baked the cake yesterday. Whatever can go wrong went wrong. First the egg whites, as I was beating they turned watery, had to discard and start all over again. Then when the cake was baked, I had to let it cool away from kids hands, was carrying it, my son screamed and I almost dropped it, in the process of saving broke the cake to two. But anyways covered it with icing. Sliced some almonds to use them for decoration. All in all, the effort for baking this cake was more than I usually put in, but learnt a lot baking this. 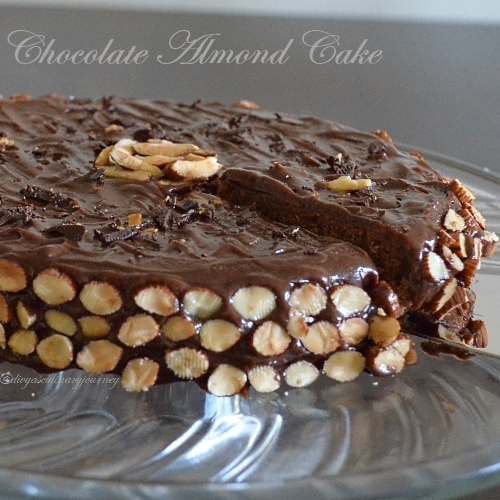 Really glad that I baked this cake,as I have never tasted a cake this delicious in my life. 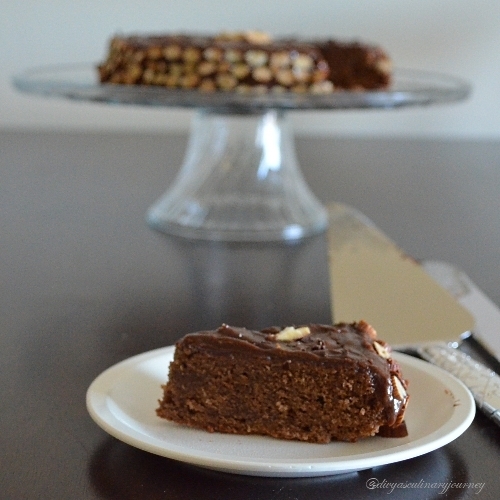 The rich chocolate almond combo in this soft spongy cake made me fall in love with it. Preheat the oven to 350 F. Grease and flour the 8 inch cake pan and set it aside. In a pan melt the chocolate with brewed coffee over a large pan of simmering water. Cream the butter and sugar for several minutes till the mixture is fluffy and pale white.Then blend in the egg yolks. With a electric beater, beat the egg whites in a slow speed, add a pinch of salt and lemon juice then increase the speed till soft peaks are formed. Then sprinkle a Tbs of sugar and keep beating till the stiff peaks are formed. Then with a spatula add the melted chocolate to the butter sugar mixture and blend them in with almond extract and pulverized almonds. Then alternating egg whites and cake flour fold them in gently till they are fully incorporated. Take care not to over mix them it will deflate the egg whites. Pour the batter in the prepared cake pan and bake for 20-25 minutes. Cool the cake pan for about 10 minutes and then remove from the pan. Let it cool completely before applying the chocolate icing. Melt the chocolate with coffee in a small pan over a large pan of simmering water. Keep a large pan of ice cold water ready. Once the chocolate is melted, transfer the chocolate pan to the ice water pan and mix the butter one tbs at a time until they are firm enough to spread. 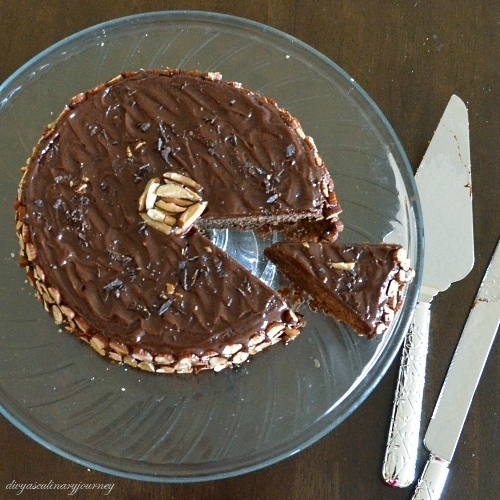 Evenly spread the icing on the cake and decorate it with chopped almonds. Since I didn't want to use the rum, used freshly brewed coffee. Also I used semi sweet chocolate chips, so used 1/2 cup of it for the cake and 1/4 of it for the icing. Take 1/2 cup of all purpose flour, take a Table spoon of flour away from it and add a Tablespoon of corn starch, sift them together and use as a substitution for cake flour. For pulverizing the almonds, just took the whole almonds and powdered them in a food processor. To check the done'ness of the cake, the cake will be puffed to the top of the pan, the tooth pick inserted comes out clean. However, the centre of the cake should move slightly when the cake pan is shaken gently. The bowl and the beater used should be clean with no traces of grease or even egg yolks. Eggs should be of room temperature. Chilled egg whites don't mount well. Lemon juice is used as a stabilizer. Alternatively you can use cream of tartar or vinegar. Cake looks super..Love the clicks..
Cake looks beautiful, it doesn't look like it survived a fall. Icing covered very well. Gorgeous cake Divya, incredible and beautifully done.We loved this cake's texture very much. Good that you could save your cake Divya! It's so much fun to work on something new, having kids around, managing them and still getting these things perfect is a hard job. Anyway well done! very beautiful cake.. inviting clicks divya.. I am proud of you dear, really delicious!!! Your cake turned out perfect! Great job! Your cake is gorgeous! I'm sorry you had such trouble and glad it turned out well in the end. Happy to be in Baking Partners with you! You did a pretty good job of concealing the broken cake and covering up the cake pieces. Nobody would have guessed. Delicious cake! cake looks beautiful all the mishaps doesn't show at all, when I baked it long back, I went with some problems as well, this time I had a flop first trying to bake eggless and then I succeeded. This looks heavenly! All the clicks are utter tempting and the cake looks so decadent.